Armstrong Drilling Inc. was founded in 1995 by Vice President of Operations, James I. Armstrong. Mr. Armstrong’s drilling experience spans over 35 years of nationwide projects for the federal government, state governments and private entities. 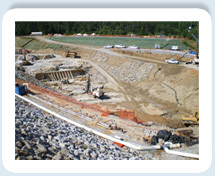 Its clients include the US Army Corps of Engineers, the Tennessee Valley Authority, the Office of Surface Mining, and the Department of Environmental Protection, among many others. Armstrong Drilling is flexible in order to fit the needs of any project and has worked hard to successfully meet the demands of its clients. Currently, the company has over 10 drilling rigs and continues to expand its fleet and capabilities. Armstrong Drilling employees are both OSHA and MSHA certified, and safety of its people is regarded as a top priority. Armstrong Drilling will complete the work you need, within schedule and budget, while maintaining the safety of your people and our staff. "We have a strong belief that the flexibility and knowledge of our dedicated staff is what allows us to handle an increasingly wide variety of construction contracts in a safe and efficient manner."